The Journey To Becoming A Morning Person. In recent weeks, I officially made the decision to become a morning person. It actually felt weird to type that out. Unfortunately, I have been fighting my procrastinating nature for years now. Yet, I always seem to be hopping out of the house with one shoe on after frantically looking for my gloves each morning. I’ve always admired people who consider themselves a “morning person.” How nice it must be to climb out of bed to do some morning yoga, followed by breakfast, tea and a little reading. The thought of me ever being able to do any of those things in the morning was actually laughable. However, after a couple days in a row of speeding to the train station and literally sprinting to catch my train just as it was about to pull off….I decided that I’d had enough. After going through all of that, I would arrive to the office already feeling like I'd been through an 8 hour work day. Ultimately, being that stressed every single morning is just not okay. It’s been a couple of weeks now since I decided to switch up my morning routine for the better. Though I’m still a work in progress, just waking up earlier over the last couple of weeks alone, I’ve noticed a great change in how I feel in the mornings. 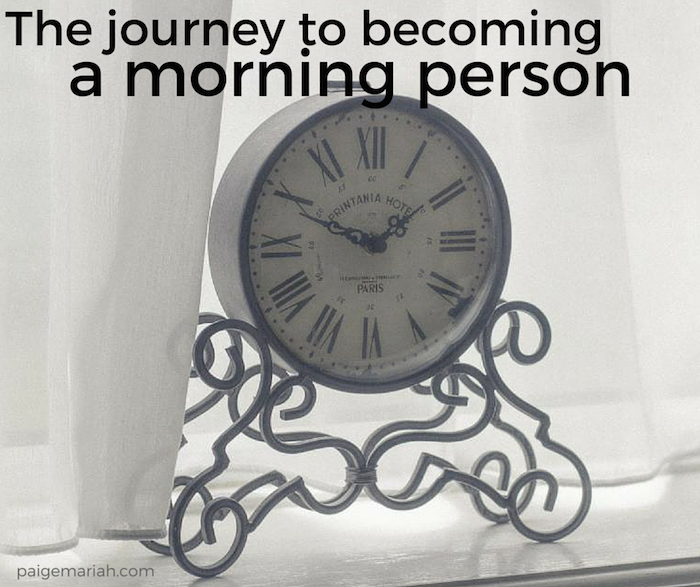 Check out the steps that I’m taking on my journey to become a morning person! Meal prepping for the entire week on Sunday: Meal prepping is something that I’ve actually been attempting to do weekly even before I decided that I wanted to become more of a morning person. Not only does having every lunch ready for the week save me time in the morning but it helps me to have more control over what I’m eating, as well as saves me money that I would be spending to eat out. I even prep my breakfast, having my oatmeal and fresh fruit in a baggy and ready to go! Laying out outfit and accessories the night before: This has probably been one of the most positive contributions to my new routine. Picking out an outfit unnecessarily took up a lot of my time in the morning. There was always something that I couldn’t find or something that needed to be ironed. Now that I’m preparing my outfit the night before, I feel so much more at ease knowing that I can just hop out the shower, put on my prepared outfit and go. Going to sleep earlier: Now I’m pretty sure this is a given. Sleep is very important to me and my body is never happy with me when I decide to get up after having anything less than 7 hours of sleep. So the longer I would stay up at night, the harder my body would fight me to get out of bed in the morning. Therefore, I’ve been working hard to get in the bed and actually close my eyes at an earlier hour so that I have a better chance at waking up earlier! Holding back on hitting snooze: After moving my bedtime up, I decided that I’d like to wake up about 30-45 min. earlier as well. Now this is no easy feat, being that I’m so used to hitting the snooze button at least 4 times every morning. Luckily, with the help of the above steps, I’ve been able to limit hitting the snooze button to only once and sometimes not at all. Though it always felt like it…the snooze button was never my real friend. Getting that energy going: This is the next huge step that I’d love to add to my “morning person” routine. Once I feel a little more comfortable and confident in waking up even earlier, I would love to fit in a 20 min home workout in the mornings. Though it still feels crazy that I’m actually not rushing to work anymore, I’d love to push myself another step forward and fit something productive into my morning routine. I always feel like I can conquer the world after a great workout, I can only imagine how great it would be to start my day off with that same feeling. I’m super excited about these positive changes that I’ve been making and I look forward to keeping it going forever. I even heard recently that research shows that 90% of millionaires wake up before 6am. Now who doesn’t want to be a millionaire? I see a new goal in the making! Loved this post! I am working on becoming a morning person and these tips will definitely make the transition a little smoother.